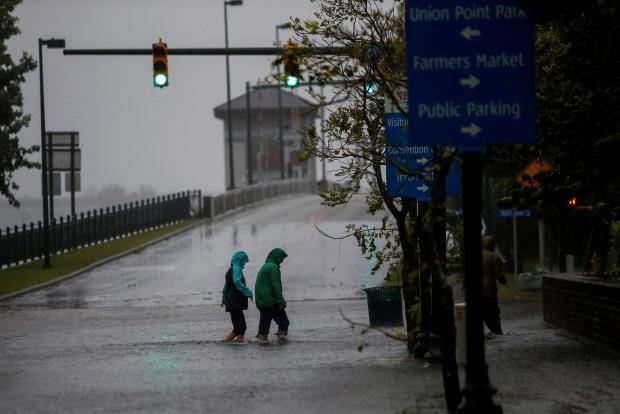 The centre of the hurricane's eye came ashore at about 0715 EDT near Wrightsville Beach close to Wilmington, North Carolina, with sustained winds of 90 miles per hour (150 kph), the National Hurricane Center (NHC) said. "WE ARE COMING TO GET YOU," New Bern city officials said on Twitter. "You may need to move up to the second story, or to your attic, but WE ARE COMING TO GET YOU." More than 60 people, including many children and pets, were evacuated from a hotel in Jacksonville, North Carolina, after strong winds caused parts of the roof to collapse, local officials said. No one was hurt. Forecasters said the Category 1 storm's extreme size meant it could batter the US East Coast with hurricane-force winds for nearly a full day. People walk on a local street as water from Neuse River starts flooding houses upon Hurricane Florence.